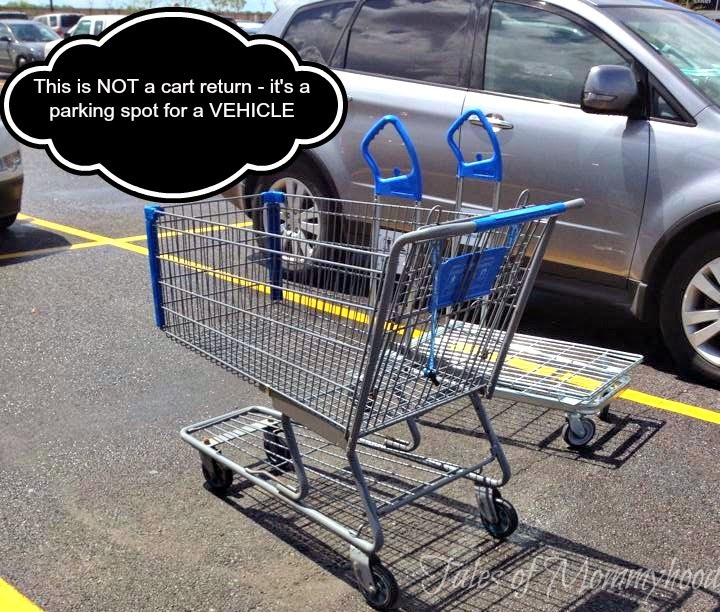 Seeing carts left in parking spaces and lots, and not returned to the store or cart return area absolutely drives me nuts. This was in a Walmart parking lot on a Saturday afternoon. There were hardly any spots open, and then I see this as I pull into the spot beside them. When I left the store, an hour later, they were STILL there. I returned them when I took my cart back. What drives you crazy when you see it? The cart thing drives me crazy too. Especially when the wind catches them and rolls them into a car. People are lazy, and figure it is someone else's job to return the cart. I hate when this happens too, inconsiderate people! Oh my gosh, I hate seeing this! I cannot believe that people are so lazy and your reader's comment about them rolling into cars is something that I always think too. That totally drives me nuts! This irks me but people who don't have babies or who are not pregnant who PARK in the expecting mommy or baby parking spots really irritate me. I think they should have a slot for Grandma's. I always put my cart back...no use in it rolling around!